Today the snow in Athens is something unbelieveble, I don't remember snowing like that for many years .This moment Greece is been covered from 2 cold waves one from Russia and another from Scandinavia so you can imagine what is going on. It is close to midnight as I took this video and pictures,if the snow will continue tommorow then I will go up to Acropolis and that some real good pictures from there.Temperatures deep bellow zero....Enjoy. It is funny that I write this article while the summer just begins ,but after all at the moment is so hot though is only the beginning of May. 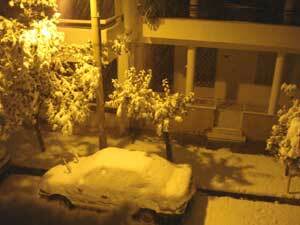 Going through my pictures today I find a collection from a winter in Athens a couple of years before. As you will see snow in Athens though is rare it can be happen, even in our days with the greenhouse effect and the polluted sky of Athens Greece that only 40 years ago was sparkling blue like the Greek seas. I remember as a child almost every year we had white Christmas and all children in our neighborhood use to run out in the street to play snow balls and to build snowmen. 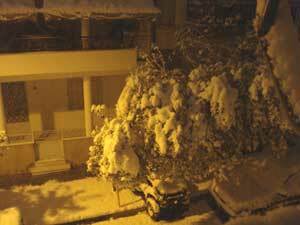 Mostly I will publish pictures with snow in Athens so you can take a taste about how it looks like Athens dressed in snow. 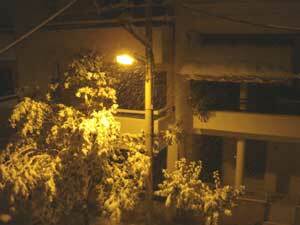 Even that big city becomes silent under the snow blanket. Winter in Greece is usually mild but in Northern Greece can become really hard ,there are places like Nevrokopi that the temperatures in the winter can go under -20 degrees C .In the islands of the Aegean is mild but very humid . Like in most big cities so in Athens snowing is like a holiday ,many Athenians will not drive to the work due to the absolute traffic chaos .The ones with their 4 wheels Jeeps equipped with chains in the tires will drive in the mount of Parnitha for skiing or just for an excursion and the main theme in the prime time new in the Greek TV will be the snow event. After all Athens is not Saint Moritz of Switzerland or Kitzbuhel of Austria and snow indeed is rare in our days.